Pride of Cincinnati narrowly clinched the IW title, while Tarpon Springs HS won its second SW gold. Also taking top honors were Juxtaposition (IO), Shenendehowa HS (SO), Paramount A Winterguard (IA), and Bellevue West HS (SA). Pulse Percussion (PIW), Ayala HS (PSW), Vigilantes Indoor Percussion (PIO), Sparkman HS (PSO), STRYKE Percussion 2 (PIA), Victor J. Andrew HS (PSA), Ayala HS (PSCW), and Dakota Ridge HS (PSCO) all won big. STAR MATERIAL: THE COLOR GUARD FINALS FEATURED A WHOLE LOT OF DRAMA. 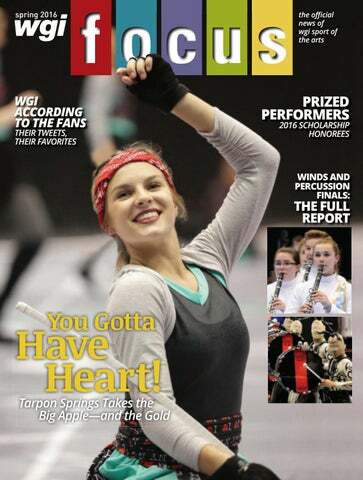 The amazing rise of Tarpon Springs HS ... Sonya Tayeh’s “Day After” clinic ... What people were tweeting at the World Championships ... Neil Larrivee enters the WGI Hall of Fame ... In memoriam: Lynn Lindstrom ... and more! In its oﬃcial WGI Winds debut, Aimachi (WIW) came up golden, along with Avon HS (WSW), STRYKE Wynds (WIO), Cleveland HS (WSO), FIU Independent A Winds (WIA), and Jackson County Comprehensive HS (WSA). WHIRLWIND FORCE: THE NUMBER OF WGI WINDS GROUPS NEARLY DOUBLED IN THE ACTIVITY’S SECOND YEAR. participating guards in the 1978 championships to more than 300 in the ﬁnal year of her directorship. She also helped spearhead WGI’s expansion into percussion and marching band competitions. It’s fair to say that WGI wouldn’t exist without Lynn Lindstrom. As long as it does, her legacy will always be treasured. NEIL LARRIVEE AT THE 2016 HALL OF FAME INDUCTION. LEFT FROM TOP: DARTMOUTH HS 2007 AND 2008. Handcrafted in Holland Adams Instruments are proudly distributed in the U.S. by Pearl Corporation. hat a difference 365 days make! Last year’s WGI Color Guard World Championships were blessed by warm, sunny weather; for 2016’s edition, light snow blanketed the ground on the morning of Finals. But the action on the floor was still sweltering, and there was more of it than ever. The number of Finalists this year expanded by one third to 119, in order to accommodate increasing entries and provide additional performance opportunities to a greater number of guards. For the first time, Finals were held at multiple locations, with A Class Finals occurring at the Nutter Center while Open Class Finals took place simultaneously across town inside UD Arena. The many placement changes between Prelims, Semi-Finals, and Finals ensured that there was no shortage of drama. Santa Clara Vanguard’s razor-thin margin over Pride of Cincinnati in the first two performances vanished by a few tenths in Independent World Finals. A Semi-Finals tie in Independent Open was resolved as Juxtaposition edged the Pacificaires, with Lexis nipping at their heels as the top three guards were separated by a scant 0.35. The other class winners maintained their leads throughout the weekend, but the order shuffled underneath as numerous guards jumped a few spots in the final order. Trends for this season included an increased use of props that were integral components of the productions, along with a higher level of sophistication in staging and choreography by the designers. And the fans came in droves, as Saturday evening’s World Class Finals smashed previous attendance records. With floor-length deep blue dresses and absolute precision, Gold Medalist Bellevue West HS (Neb.) enchanted the audience with its performance of “River Voices.” The beautiful bumblebees of Silver Medalist Smithfield-Selma HS (N.C.) got the crowd buzzing in “To Bee or Not to Bee.” Dainty and witty, “Wasting Time” by Bronze Medalist Victor HS (N.Y.) delivered the sort of free spirit normally only found in a young girl in summer. Champions Depend on Yamaha Yamaha congratulates Pulse Percussion, which just brought home its third WGI World Championship. Pulse plays the Yamaha 9300 Series Marching Snare Drums and the 8300 Series Multi-Toms and Bass Drums. Like all Yamaha marching percussion instruments, they deliver superior hardware performance, excellent tone projection and exemplary articulation. These features are the result of ten years of Yamaha research with the world’s top performing ensembles. So it's no surprise that these instruments — placed in the hands of an indoor percussion group with the talent and ingenuity of Pulse — build champions! record total of 225 indoor percussion lines came to Dayton, Ohio, April 14-16 for the 2016 WGI Percussion World Championships, including 83 Independent and 142 Scholastic groups. Impressively, all six marching World Class medalists heralded from the same circuit in southern California, making this a golden year for the Golden State. In the following pages, you’ll ﬁnd every ensemble that took the ﬂoor for Finals, presented in ﬁnishing order. inhumanity of the U.S. government’s relocation of Native Americans in “We Shall Remain.” POW Percussion (Calif.) showed in “Hands” that while our hands can be used for violence, few of the actions we most cherish—such as holding the hand of a parent—can be achieved without them. Dark Sky Percussion (Calif.) broke free of the office pack mentality in “The Call of the Wild,” ditching briefcases to become members of a very different sort of pack. Atlanta Quest (Ga.) explored the contrast of extremes in “SUPER,” with players drastically varying their volume, speed, and intensity. tables in “When the Tables Turn,” continually establishing new staging areas. Ben Davis HS (Ind.) honored those who fought for their country while implying the futility of war in “The Good Earth,” complete with a military funeral. Leigh HS (Calif.) proclaimed, “We’re All MAD Here,” playing around a long Mad Tea Party table—Mad Hatter included—as in Alice’s Adventures in Wonderland. Milton HS (Ga.) explored the heavens in “Stellar,” with a lift-off that made it appear as if the drums were entering outer space and long banners as re-entry sparks. Stay trendy cTHE SPORT OF THE ARTS! Call us today for your next durable custom performance floor tarp. missed an amazing event. If you plan on sticking around next year (you should), you’ll ﬁ nd that WGI Winds is in no way a letdown from the percussion performances. If anything, it’s a cherry on top of the sundae that is the WGI World Championships. Aimachi (Japan) put on a Gold Medal-worthy spectacle in “Ascension,” chock full of traditional and contemporary Japanese ﬂavors, punctuated with colorful ﬁreworks and breathtaking theatrics. Rhythm X Winds (Ohio) featured neither storyline, props, nor sets during “Aurora,” based on popular composer John Mackey’s “Aurora Awakes”—Mackey himself was in Dayton earlier in the week to polish the group’s presentation. Orange County Independent Winds Ensemble (Calif.) played Bernard Herrmann’s “Psycho” and Michael Daugherty’s “Desi” in a show titled “Shooting Warhol,” inspired by the famed pop artist. University of North Georgia (Ga.) was the only Winds ensemble to march a large drum battery, playing “Attraction: The Music of Scheherazade.” FIU Indoor Winds (Fla.) oﬀered a literal representation of Atlas bearing the planet on his shoulders in “Weight of the World.” Project Arts (Fla.) explored “PRECAMBRIAN,” the era that accounts for 88% of geologic time, including the earth’s creation. by the story of the mythological poet/musician Orpheus in “Underworld,” performed against a hellish landscape with molten ﬂags and ﬂickering torches. Father Ryan HS (Tenn.) led a museum tour during “The Gallery,” pondering some of the most famous artworks in the world, only to be interrupted by the alarms and lockdown resulting from a theft. Greenﬁeld-Central HS (Tenn.) proved that “April Showers” bring May ﬂowers, basing its show largely on Borodin’s celebratory “Polovtsian Dances” from Prince Igor. STRYKE Wynds (Fla.) set “Déjà Vu” in a surreal, dream-like state. As every ending has a beginning, the Gold Medal-winning show started and ended with the same drill set. Carolina Gold (N.C.) played Barber’s Symphony No. 1 during “One,” a show about how one thing leads to another and everything shares a connection. Entourage (Mich.) built “Life as a House,” the story of someone who had three months to live and wanted to spend them at home. Top Ranking Groups for Winds “After Midnight,” Elk River HS (Minn.) created a wee-weehours jazz nightclub scene so real you could practically smell the cigarette smoke. Custom designed and made for 2014 Blue Knights Drum & Bugle Corps. The 2016 season was a wild ride. Along the way, we created something unforgettable. Seasons end, but the memories last forever. CONGRATULATIONS TO OUR 2016 WGI WORLD CHAMPIONSHIP MEDALISTS & FINALISTS: AYALA HIGH SCHOOL – GOLD MEDALS Scholastic Concert & Marching Percussion World Class SPARKMAN HIGH SCHOOL – GOLD MEDAL Scholastic Marching Percussion Open Class BROKEN CITY – BRONZE MEDAL Independent Marching Percussion World Class RIVER CITY RHYTHM – BRONZE MEDAL Independent Marching Percussion Open Class PLYMOUTH HIGH SCHOOL – SILVER MEDAL Scholastic Winds World Class OCI WINDS ENSEMBLE – BRONZE MEDAL Independent Winds World Class ENTOURAGE – BRONZE MEDAL Independent Winds Open Class Additional Finalists: Bakersfield College, Freedom Percussion, Huron Valley Percussion, Irondale High School, Matrix, Matrix Open Percussion Ensemble, Mechanicsburg High School, University of North Georgia Special salute to the FREE PLAYERS DRUM CORPS for their outstanding exhibition performances! For over 30 years, the WGI Scholarship Program has provided more than $500,000 to assist the creative studies of young guard and percussion members. WGI is proud to recognize the performers who earned awards at the 2016 World Championships through the WGI Scholarship Program. These 13 talented young people will receive grants ranging from $1,000 to $3,000, with funds provided by private sources as well as WGI sponsors. This yearâ&#x20AC;&#x2122;s Zildjian/Mark Thurston Scholarship was won by Randy Villegas of Bakersfield College; Mia Thompson of Edwardsville HS received the Yamaha/ Dennis DeLucia Scholarship; and Fred J. Miller Memorial awards went to Tyler Gerton of Vigilante Percussion and Jamie Kasieqicz of Trumbull HS. Georgiana Biggs of Lambert HS received the Bob Wiles Memorial Scholarship, Pride of Cincinnatiâ&#x20AC;&#x2122;s Caitlin Daffron won the Mike McCool Memorial Scholarship, and the first Lynn Lindstrom Memorial Scholarship went to Thao Dao of Solstice HS. Want to give to the WGI Scholarship fund? 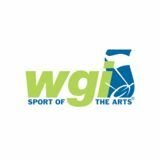 Go to wgi.org/scholarship or mail your donations to WGI Scholarship Donation, 2405 Crosspointe Drive, Dayton, OH 45342. Find out the scoop from the 2016 WGI World Championships!